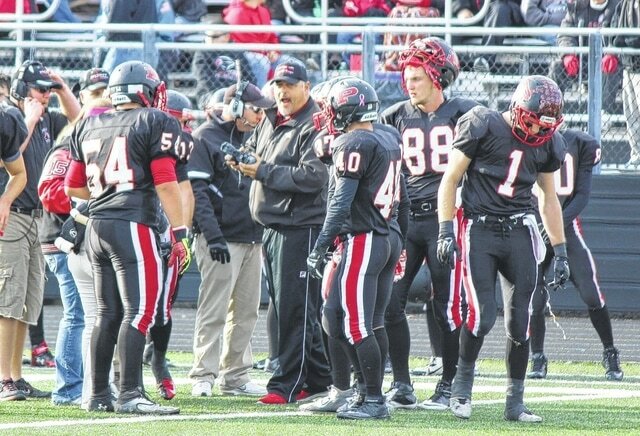 Point Pleasant football coach Dave Darst, middle, relays a few last instructions coming out of a timeout during a 2015 Class AAA opening round playoff contest against Jefferson at OVB Field in Point Pleasant, W.Va.
High school football season was 60 days away as of Monday, meaning the start of the 2015 campaign is inching closer to its kickoff date of 7:30 p.m. Friday, Aug. 28, at a field near you. The upcoming gridiron season will resemble much of last fall’s schedule, as all nine teams in the Ohio Valley Publishing area will be competing for postseason berths in the same divisions and regions that each was affiliated with in 2014. Most of the 2015 scheduling is also similar throughout the tri-county region, as only 13 of the 87 games to be played are against different opponents from a year ago. In fact, Wahama, Eastern and Southern are playing the same 10-game schedule each did a year ago, while River Valley, South Gallia and Point Pleasant have only one change apiece in their respective schedules from last fall. Only two of the nine schools — Gallia Academy and Hannan — do not, as of now, have a full 10-game schedule for the 2015 campaign. The Blue Devils currently have a Week 2 opening, while the Wildcats have only eight games under contract for the upcoming gridiron season. Both Point Pleasant and Wahama made the playoffs a year ago, the only teams of the nine local programs to reach the postseason in 2014. Southern was the last Ohio team to make the playoffs, doing so back in 2013. Here’s a look at the 2015 football schedules for all of the teams in the OVP area. 25 vs Point Pleasant, 7 p.m.
16 vs Warren, 7 p.m.
23 vs Logan, 7 p.m.
30 at Jackson, 7 p.m.
30 at Shadyside, 7 p.m.